AL Amyloidosis (also called “primary” amyloidosis) is a blood illness in which a special protein builds up in various parts of the body. This protein, called “M-protein,” is actually made up of pieces from immunoglobulins (also called antibodies) which are naturally in the body and fight off infection. In the case of people with amyloidosis, too many of these disease fighting pieces are present in blood flow. They can get stuck in almost any organ in the body, such as the brain, the lungs, the liver, the heart, the skin, or the kidneys. As these proteins build up, they begin to get in the way of the job of whichever organ they are in. Although AL amyloidosis can be assumed from many of its different symptoms (see below), the only way to know for sure that it is there is to analyze the cells with a biopsy. 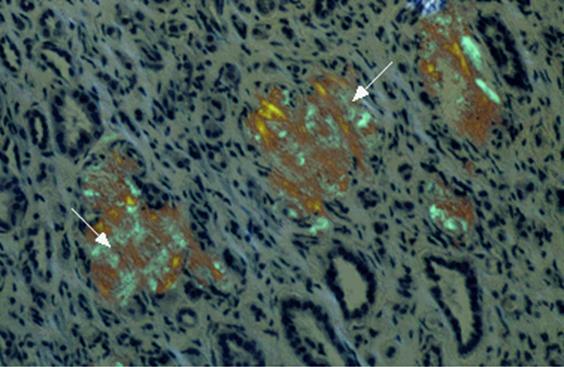 In the kidney, this irregular amyloid protein can get stuck in the filtering unit. As the amyloid builds up, the kidneys are no longer able to work properly. Amyloid in the kidney can cause leakage of protein in the urine resulting in a low blood protein level and swelling of legs or face. This syndrome is known as “Nephrotic Syndrome”. Also, the kidneys normally filter and clean the blood, getting rid of the body’s natural waste products as urine. If they are unable to do this, these waste products build up in the blood. This is called kidney failure. Eventually kidney failure can also cause problems with low red blood cell count (also called anemia), high blood pressure, and fluid buildup. This filtering is how your body gets impurities out of the blood (and removes extra water), and some of the cleaned blood becomes your urine. Urine isn’t red (like blood) because the red blood cells, which give blood its color, are too big to fit through the filters. A glomerulus is just a tiny bag of blood containers through which blood gets filtered, and all of the clean blood (urine) runs into tubes (ureters) which eventually lead to your bladder. 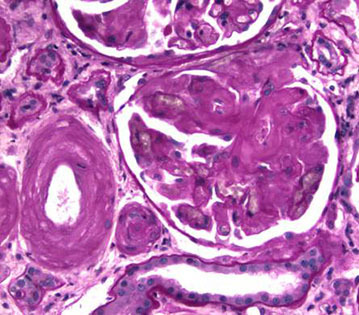 Shown above are two glomeruli, or kidney filters, as they look under a microscope. The normal filter is on the left, and the filter damaged by this disease is on the right. In the normal filter (left), there are many open “loops” scattered throughout- these are all small blood vessels seen in a small piece cut from the kidney. In the affected filter on the right, almost all of these loops have flattened because of all the built up of amyloid protein. Shown above is another kidney filter (glomerulus). This time a “stain” has been added that turns the damaged cells bright green. This is another stain that is used in finding disease, called “Congo Red”. This stain turns “bright apple green” when it touches the sick cells. Rarely people can have this “M-protein” stuck in the kidney in a variety of different patterns without affecting other organs in the body. 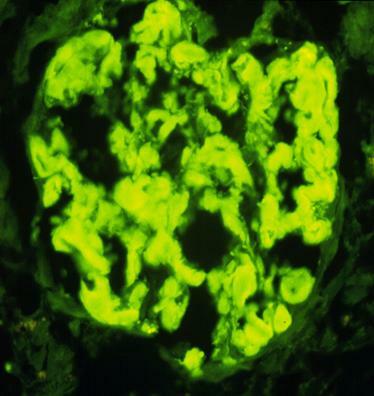 When only the kidney is affected and there is no blood cancer, then these different patterns are often called “Monoclonal Gammopathy of Renal Significance” (MGRS). 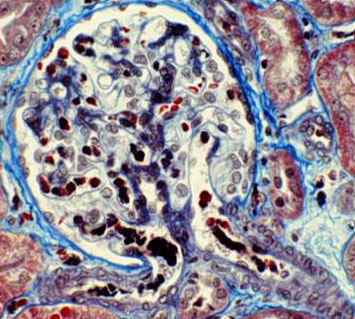 Above is an example of a different type of kidney damage by the M-protein known as “Monoclonal Immunoglobin Deposition Disease” (MIDD). “MGRS” can sometimes have no symptoms in a patient, or can present with kidney failure and/or swelling of legs and face due to protein leak as discussed above. We don’t yet know why some people get AL amyloidosis, even though 1,000-3,000 new cases are found each year in the US. About 2/3 of these patients are male, and almost all of them are over the age of 40. 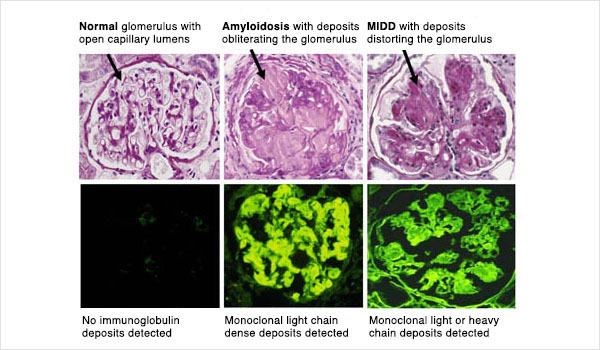 Although this type of amyloidosis can occur by itself, it often happens with other blood disorders, such as multiple myeloma and Waldenstrom’s Macroglobulinemia. Both of these are diseases of the type of blood cells that produce antibodies. Amyloidosis can harm many organs other than the kidney, and its symptoms can therefore be very different. Some of the most common are listed below, along with the organs involved. Amyloidosis can be determined from any of the problems listed above. Both the blood and the urine can also be tested for the M-protein that causes this disorder. However, an actual diagnosis requires a sample of an effected organ. Although this can be any organ, such as skin or bone marrow, sometimes this disease can only be diagnosed by looking at a piece of your kidney. Sometimes a bone marrow transplant is needed as well. Patients that respond to therapy usually have stabilization of their kidney disease as well. When they do not, kidney replacement therapy (dialysis) may become necessary. This page was reviewed and updated in September 2018 by Koyal Jain, MD.